I went to my local hardware store to buy one of the latest hammers. I brought the hammer home but it was unable to build the shed in my backyard. I spoke to someone else who said something similar. They bought the hammer and it didn't build what they wanted it to do. The expectation was that the hammer should do what it needs to do automatically and if it doesn't then the hammer is broken. It doesn't live up to its expectations, it wasn't the best investment, and the hammer developers need to start over. Every now and then there are articles about how a certain security technology is broken. The recent focus of criticism is SIEM technology. It's broken because it doesn't do everything automatically and live up to peoples' expectations. The expectation that the technology should be able to be implemented and then automatically solve problems. Similar, to the expectation of a shed being built by simply buying a hammer. The hammer is not at fault; similar to the security technology not being at fault. Both of them are tools and the issue is with who is wielding that tool. The hammer is not broken. The security technology is not broken. What is broken is the person (or organization) holding the tool. They need the critical thinking and problem solving skills to make the tool do what it needs to do and meet expectations along the way. "analysts can be trained to use a tool in a rudimen-tary manner, they cannot be trained in the mind-set or critical thinking skills needed to master the tool"
The issue is not with the tool. The issue is the organization hasn't put the tool in the right peoples' hands and until they do the brokenness won't be fixed. An alert fires about an end point potentially having a security issue. The end point is not in the cubicle next to you, not down the hall, and not even in the same city. It's miles away in one of your organization's remote locations. Or maybe the end point is not miles away but a few floors from you. However, despite its closeness the system has a one terabyte hard drive in it. The alert fired and the end point needs to be triaged but what options do you have. Do you spend the time to physically track down the end point, remove the hard drive, image the drive, and then start your analysis. How much time and resources would be spent approaching triage in this manner? How many other alerts would be overlooked while the focus is on just one? How much time and resources would be wasted if the alert was a false positive? In this post I'll demonstrate how the Tr3secure collection script can be leveraged to triage this type of alert. Triaging requires a delicate balance between thoroughness and speed. Too much time spent on one alert means not enough time for the other alerts. Time is not your friend when you are either trying to physically track down a system miles away or imaging a hard drive prior to analysis. Why travel miles when milliseconds will do? Why collect terabytes/gigabytes when megabytes will do? Why spend time doing deep dive analysis until you confirm you have to? The answer to all these questions is to walk the delicate balance between thoroughness and speed. To quickly collect only the data you need to confirm if the alert is a security event or false positive. The tools one selects for triage is directly related to their ability to be thorough but fast. One crop of tools to help you strike this balance are triage scripts. 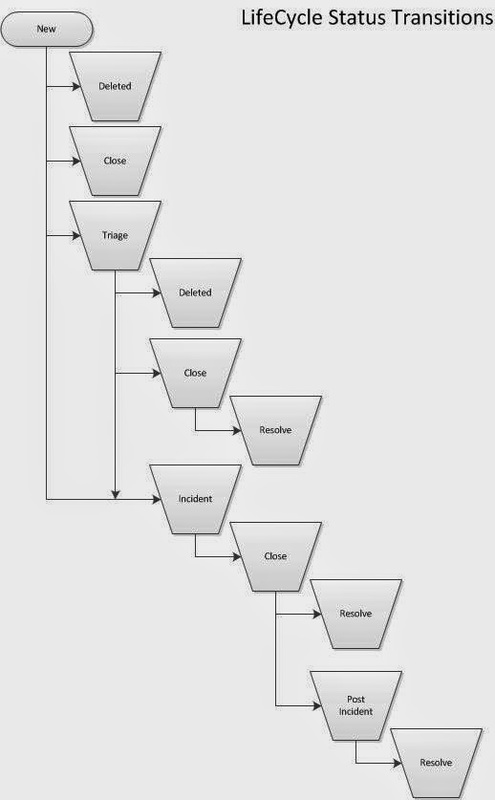 Triage scripts automate parts of the triage process; this may include either the data collection or analysis. The Tr3secure collection script automates the data collection. In my previous post - Tr3Secure Collection Script Updated - I highlighted the new features I added in the script to collect the NTFS Change Journal ($UsnJrnl) and new menu option for only collecting NTFS artifacts. Triaging the alert I described previously can easily be done by leveraging Tr3Secure collection script's new menu option. To demonstrate this capability I configure a virtual machine in an extremely vulnerable state then visited a few malicious sites to provide me with an end point to respond to. The command prompt was accessed on the target system. A drive was mapped to a network share to assist with the data collection. The network share not only is where the collected data will be stored but it is also where the Tr3Secure collect script resides. The command below uses the Tr3Secure collection script NTFS artifacts only option and stores the collected data in the network share with the drive (Y:). Disclaimer: leveraging network shares does pose a risk but it allows for the tools to be executed without being copied to the target and for the data to be stored in a remote location. The image below shows part of the output from the command above. In addition to looking for the above indicators, it is necessary to ask yourself a few important questions. 1. What was occurring on the system around the time the alert generated? 2. Is there any indicators in the alert to use examining the data? 3. For any suspicious or identified malicious code, did it execute on the system? The triage steps to use is dependent on the collected data. 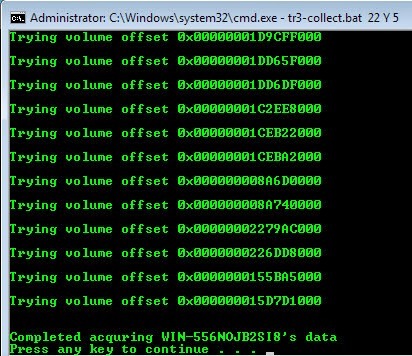 In this case, the data collected with NTFS artifacts option results in only examining: program execution and filesystem activity. These two examination steps are very effective for triaging end points as I previously illustrated in my post Triaging Malware Incidents. The image below is highlighting a suspicious program. The program stands out since it is a program that executed from the lab user profile's temporary internet files folder. Right off the bat this artifact provides some useful information. The coffee.exe program executed within the past 24 hours, the program came from the Internet using the Internet Explorer web browser, and the activity is associated with the lab user profile. The Tr3Secure collection script collects the NTFS $MFT, $Logfile, and $UsnJrnl; all of which can provide a wealth of information. These artifacts can be examined in two ways. First is to parse them and then look at the activity around the time the alert fired. Second, is to parse them and then look at the activity around the time of the identified suspicious files appeared on the system. In this post I'm using the latter method since the alert is hypothetical. The $MFT was parsed with Joakim Schicht's MFT2CSV program. The output format is in the log2timeline format to make it into a timeline. The MFT2CSV csv file was imported into Excel and a search was performed for the file "coffee.exe". It's important to look at the activity prior to this indicator and afterwards to obtain more context about the event. As illustrated below, there was very little activity - besides Internet activity - around the time the coffee.exe file was created. This may not confirm how the file got there but it does help rule out certain attack avenues such as drive-by downloads. The image below shows what occurred on the system next. There is activity of Java executing and this may appear to be related to a Java exploit. However, this activity was due to Java update program executing. The last portion of the $MFT timeline is shown below. A file with the .tmp extension was created in the temp directory followed by the creation of a file named SonicMaster.exe in the System32 folder. SonicMaster.exe automatically becomes suspicious due to its creation time around coffee.exe (guilty by association.) If this is related then that means the malware had administrative rights, which is required to make modifications to the System32 folder. The task manager is executed and then there was no more obvious suspicious activity in the rest of the timeline. The remaining activity was the lab user account browsing the Internet. At this point the alert has been properly triaged and confirmed. The event can be escalated according to the incident response procedures. However, addition context can be obtained by parsing the NTFS Change Journal ($UsnJrnl). Collecting this artifact was the most recent update to the Tr3Secure collection script. The $UsnJrnl was parsed with Joakim Schicht's UsnJrnl2CSV program. The next portion as shown below, shows coffee.exe executing, which resulted in the modification to the Recentfilecache.bcf. Following this the tmp file is created along with the SonicMaster.exe file. The interesting activity is the data overwrites made to the SonicMaster.exe file after it's created. Immediately after the SonicMaster.exe file creation the data overwrites continued to other programs as illustrated below. 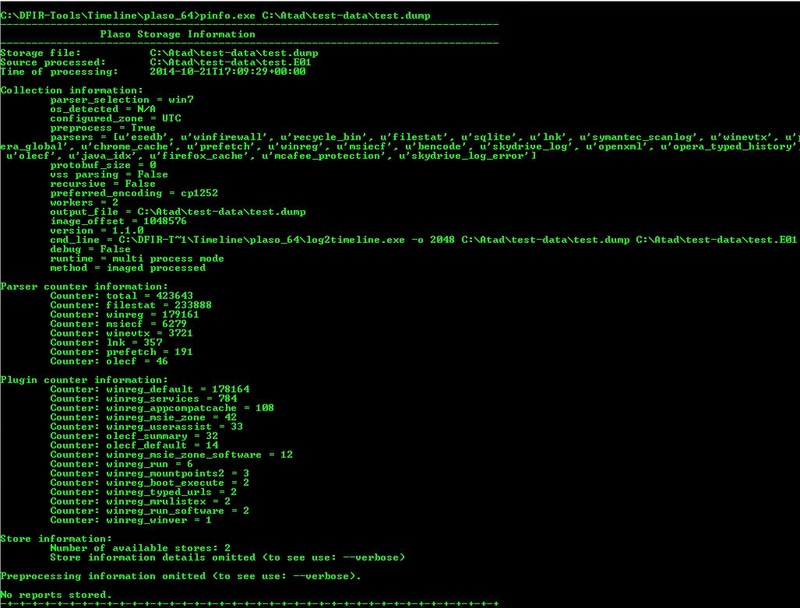 To determine what is happening would require those executables to be examined but it appears they had data written to them. The executables were initially missed in the $MFT timeline since the files by themselves were not suspicious. They were legitimate programs located in their correct folders. However, the parsed $UsnJrnl provided more context about the executables and circling back around to the $MFT timeline shows the activity involving them. Their $MFT entries were updated. As I mentioned previously, triaging requires a delicate balance between thoroughness but speed. It's a delicate balance between quickly collecting and analyzing data from the systems involved with an alert to determine if the alert is a security event or false positive. This post highlighted an effective technique for triaging an end point and the tools one could use. The entire technique takes minutes to complete from beginning to end. The triage process did not confirm if the activity is a security event but it did determine additional time and resources needs to be spent digging a bit deeper. Doing so would had revealed that the coffee.exe file is malicious and is actually the Win32/Parite file infector. The malware infects all executables on the local drive and network shares. Digging even deeper by performing analysis on coffee.exe (Malwr report and Anubis report) matches the activity identified on the system and even provides more indicators (such as an IP address) one could use to search for other infections in the environment. It was a little over four years ago I started a new journey. The timing wasn't the best when I took my first step into the blogging world. My family welcomed our third son into the world, I was doing challenging work for my employer, and I was still pursuing my Masters degree attending school full time. Needless to say, starting a blog would just compete for the little spare time I had. 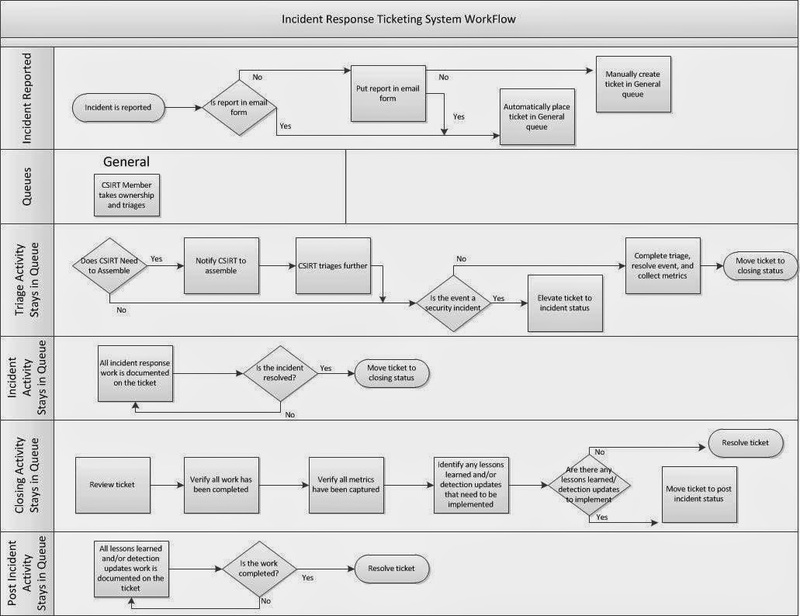 After talking things over with my wife I took the first step by launching this blog: Journey Into Incident Response (jIIr.) 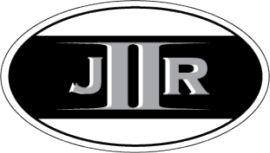 I've been reflecting about this journey since jIIr has surpassed 500,000 page views. So much has changed in the past four years. I started out with my sights set on incident response and now I'm building out and managing an enterprise-wide incident response and detection program. I have been sharing my journey, my research, and thoughts on jIIr for others to read and learn from. To those who either read one post or numerous posts I wanted to say thank you. Thank you for taking the time to read what I have written. To those who went one step beyond to leave a comment or send me an email I wanted to thank you as well. Blogging is a challenging endeavor and comments are very encouraging. jIIr started out as a way for me to share back to the digital forensic and incident response community. Shortly after jIIr's launch my motivations changed. What drove me to maintain the blog was no longer sharing back to the community. It's not necessary to share my motivations because at the end of the day is what matters the most is my ability to help others by sharing what I do. Each jIIr post is an effort to help anyone who may read it. For them to take the information and apply it in their lives and/or work. To those people and organizations who have shared jIIr content either by linking to my posts, retweeting my tweets, forwarding along links, or sharing your thoughts on your own websites. Thank you. Thank you for sharing; jIIr would not be reaching the audience it is today without your support. To those who continue to share jIIr content, I cannot say how grateful I am. The past four years have been a humbling experience. God has blessed my with a passion for DFIR and the ability to communicate in the written form. For as long as I'm capable, I'll continue to do what I do so at the end of the day others who stumble upon this site may be helped in some way. On my to-do list for some time has been to add support back into the Tr3Secure collection script to obtain the NTFS Change Journal ($UsnJrnl). This is a quick post about this functionality being added back to the collection script. The issue I faced was the following. There are very few tools capable of collecting NTFS artifacts from live systems; even fewer for collecting the $UsnJrnl. The Tr3Secure script uses Joakim Schicht's tool RawCopy to collect files off of live systems. It is one of the few and - as far as I know - the only open source option. Rawcopy pulls files either by their $MFT record number or the file path. Pulling NTFS artifacts requires the $MFT record number. The challenge is the $UsnJrnl does not have a consistent $MFT record number like the other NTFS artifacts. For most scripting languages this wouldn't be an issue but Tr3Secure is a batch script. Batch scripting doesn't support storing a command's output into a variable. Translation: there is not an easy way in batch scripting to query the $UsnJrnl's $MFT record number, store it into a variable, and then use that variable with RawCopy to collect it. This is why adding the functionality back into the script has been and remained on my to-do list until now. "$J may be sparse, which would mean parts of the data is just 00's. This may be a significant portion of the total data, and most tools will extract this data stream to its full size (which is annoying and a huge waste of disk space). This is where this tools comes in, as it only extract the actual data for the change journal. That way extraction obviously also goes faster. Why extract 20 GB when you might only need 200 MB?" 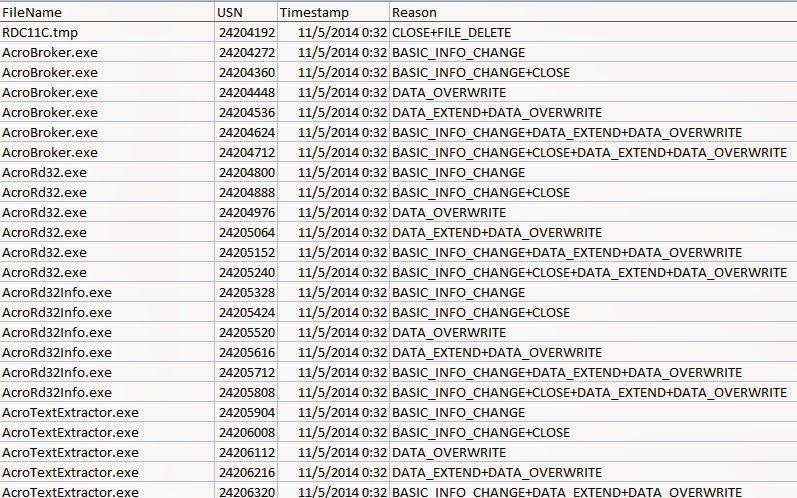 The tool not only collects the $UsnJrnl $J alternate data stream but it only extracts the portion containing data. This not only saves space but it makes the collection faster; especially if pulling it over the wire. The tool is command-line making it easy to script with. I updated the Tr3Secure collection script to use the ExtractUsnJrnl tool for grabbing the $UsnJrnl. ExtractUsnJrnl is really a cool tool so I wanted to take the time to highlight it. I performed a simple test. Collect the $UsnJrnl $J file with one tool (FTK Imager) to see how long it takes and what the file size is then use ExtractUsnJrnl. The image below shows the $UsnJrnl from a 1TB solid state drive. The file size difference is significant; one file is 4.6GB while the other is 36MB. Both tools were ran locally but ExtractUsnJrnl completed within seconds. The image below shows the $UsnJrnl from a 300GB removable drive. Again, notice the difference between the file sizes. Some may be wondering why am I so focused on the resulting file size. The reason is trying to pull a 4.6GB file over the wire from a remote system takes time. A lot of time if that remote system is in a location with a slow network link (think VPN users). By reducing the file size (i.e. 36MB) makes it easier to collect the $UsnJrnl both remotely and locally to an attached storage device. The next test I ran was to parse both $UsnJrnl $J files to see if the both contain around the same number of records. I said approximate because the hard drives were not write protected and changes may had been made between the collections. Due to this I evaluated the removable store device's NTFS Change Journal since the drive had less activity than the solid state drive. 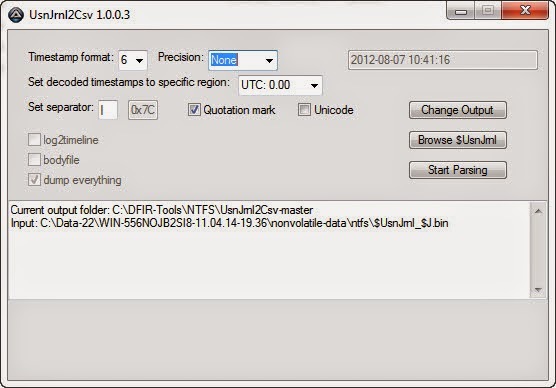 The image below shows UsnJrnl2Csv successfully parsing the $UsnJrnl $J extracted with FTK Imager. The image below shows UsnJrnl2Csv successfully parsing the $UsnJrnl $J extracted with ExtractUsnJrnl. Notice how this $J file had significantly less records. 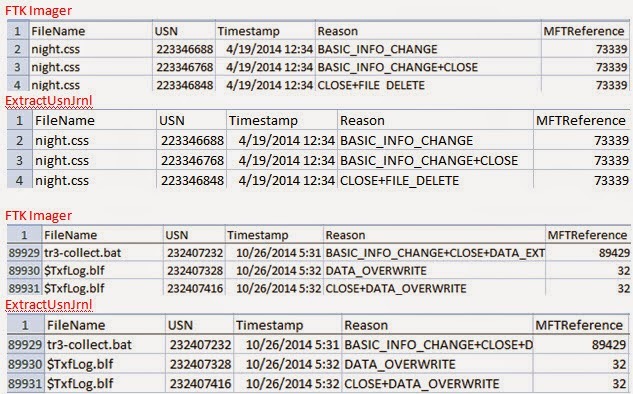 Lastly, the image below shows the comparison of the two parsed $UsnJrnl $J files from the removable media. Both outputs start at the same time with the same file and end at the same time with the same file. Selecting option 5 will only preserve select files then collect the $MFT, $Logfile, and $UsnJrnl. You can download the TR3Secure Data Collection Script from the following download site. The link is also posted along the right hand side of this blog towards the top. In the future I plan on doing a post or two illustrating how targeted collections using scripts - such as the Tr3secure collection script - can significantly speed up the time it takes to triage an alert or system. "Corey, at times our auditors find fraud and when they do sometimes they need help collecting and analyzing the data on the computers and network. Could you look into this digital forensic thing just in case if something comes up?" This simple request - about seven years ago - is what lead me into the digital forensic and incident response field. One of the biggest challenges I faced was getting a handle on the process one should use. At the time there was a wealth of information about tools and artifacts but there was not as much outlining a process one could use. In hindsight, my approach to the problem was simplistic but very effective. I first documented the examination steps and then organized every artifact and piece of information I learned about beneath the appropriate step. Organizing my process in this manner enabled me to carry it out without getting lost in the data. In this post I'm highlighting how this type of organization is applied to timeline analysis leveraging Plaso. Organizing the digital forensic process by documenting the examination steps and organizing artifacts beneath them ensured I didn't get "all mixed up" when working cases. To do examination step "X" examine artifacts A, B, C, and D. Approaching cases this way is a more effective approach. Not only did it prevent jumping around but it helped to minimize overlooking or forgetting about artifacts of interest. Contrast this to a popular cheat sheet at the time I came into the field (links to cryptome). The cheat sheet was a great reference but the listed items are not in an order one can use to complete an examination. What ends up happening is that you jump around the document based on the examination step being completed. This is what tends to happen without any organization. Jumping around in various references depending on what step is being completed. Not an effective method. Contrast this to the approach I took. Organizing every artifact and piece of information I learned about beneath the appropriate step. I have provided glimpses about this approach in my posts: Obtaining Information about the Operating System and It Is All About Program Execution. The "information about the operating system" post I wrote within the first year of starting this blog. In the post I outlined a few different examination steps and then listed some of the items beneath it. I did a similar post for program execution; beneath this step I listed various program execution artifacts. I was able to write the auto_rip program due to this organization where every registry artifact was organized beneath the appropriate examination step. What exactly are categories? I see them as the following: Examination Steps + Artifacts = Categories. I outlined my examination steps on the jIIr methodology webpage and below are some of the steps listed for system examinations. In a previous post, I said "taking a closer look at the above examination steps it’s easier to see how artifacts can be organized beneath them. Take for example the step Examine the programs ran on the system. Beneath this step you can organize different artifacts such as: application compatibility cache, userassist, and muicache. The same concept applies to every step and artifact." In essence, each examination step becomes a category containing artifacts. In the same post I continued by saying "when you start looking at all the artifacts within a category you get a more accurate picture and avoid overlooking artifacts when processing a case." This level of organization is how categories can be leveraged during examinations. Organizing the digital forensic process by documenting the examination steps and organizing artifacts is not limited to completing the examination steps or registry analysis. The same approach works for timeline analysis. If I'm looking to build a timeline of a system I don't want everything (aka the kitchen sink approach.) I only want certain types of artifacts that I layer together into a timeline. To illustrate let's use a system infected with commodity malware. The last thing I want to do is to create a supertimeline using the kitchen sink approach. First, it takes way too long to generate (I'd rather start analyzing than waiting.) Second, the end result has a ton of data that is really not needed. The better route is to select the categories of artifacts I want such as: file system metadata, program execution, browser history, and windows event logs. Approaching timelines in this manner makes them faster to create and easier to analyze. The way I created timelines in this manner was not efficient as I wanted it to be. Basically, I looked at the timeline tools I used and what artifacts they supported. Then I organized the supported artifacts beneath the examination steps to make them into categories. When I created a timeline I would use different tools to parse the categorized artifacts I wanted and then combine the output into a single timeline in the same format. It sounds like a lot but it didn't take that long to create it. Hell, it was even a lot faster than doing the kitchen sink approach. This is where Plaso comes into the picture by making things a lot easier to leverage categories in timeline analysis. Plaso is a collection of timeline analysis tools; one of which is plasm. Plasm is capable of "tagging events inside the plaso storage file." Translation: plasm organizes the artifacts into categories by tagging the event in the plaso storage file. At the time of this post the tagging occurs after the timeline data has already been parsed (as opposed to specifying the categories and only parsing those during timeline generation.) The plasm user guide webpage provides a wealth of information about the tool and how to use it. I won't rehash the basics since I couldn't do justice to what is already written. Instead I'll jump right in to how plasm makes leveraging categories in timeline analysis easier. tag_jiir.txt is still a work in progress. As can be seen in the above image, the Plaso supported artifacts are organize beneath the " Examine the Programs Ran on the System" (program execution) and " Examine the Auto-start Locations" (autostarts info) examination steps. The rest of the tag file is not shown but the same organization was completed for the remaining examination steps. After the tag_jiir.txt tag file is applied to plaso storage file then timelines can be created only containing the artifacts within select categories. The first step is taking a quick look at the system for any indications that the system may be compromised. When triaging for potential malware infected system the activity in the program execution artifacts excel and the prefetch files revealed a suspicious file as shown below. The file stands out for a few reasons. It's a program executing from a temp folder inside a user profile. The file handle to the zone.identifier file indicates the file came from the Internet. Lastly, the program last ran on 1/16/14 12:32:14 UTC. Now we move on to creating the timeline with the command below (the -o switch specifies the partition I want to parse.) FYI, the command below creates a kitchen sink timeline with everything being parsed. To avoid the kitchen sink use plaso filters. Creating my filter is on my to-do list after I complete the tag_jiir.txt file. The image below shows the "information that have been collected and stored inside the storage container." The Plaso tool pinfo was used to show this information. Now it is time to see plasm in action by tagging the events in the storage container. The command below shows how to do this using my tag_jiir.txt file. The command below creates my timeline based on the categories I want (-o switch outputs in l2tcsv format, -w switch outputs to a file, and filter uses the tag contains.) FYI, a timeslice was not used since I wanted to focus on the tagging capability. psort.exe -o L2tcsv -w C:\Atad\test-data\test-timeline.csv C:\Atad\test-data\test.dump "tag contains 'Program Execution' or tag contains 'Filesystem Info' or tag contains 'Web Browsing Info'"
The image below shows the portion of the timeline around the time of interest, which was 1/16/14 12:32:14 UTC. The timeline shows the lab user account accessing their Yahoo web email then a file named invoice.83842.zip being downloaded from the internet. The user then proceeded to execute the archive's contents by clicking the invoice.83842.exe executable. This infection vector is clear as day since the timeline does not contain a lot of un-needed data. Plaso's tagging capabilities makes things easier to leverage categories in timeline analysis. By producing a timeline containing only the categories one wants in order to view the timeline data for select artifacts. This type of organization helps minimize getting "all mixed up" when conducting timeline analysis by getting lost in the data. Plaso is great and the tagging feature rocks but as I mentioned before I used a combination of tools to create timelines. Not every tool has the capabilities I need so combining them provides better results. 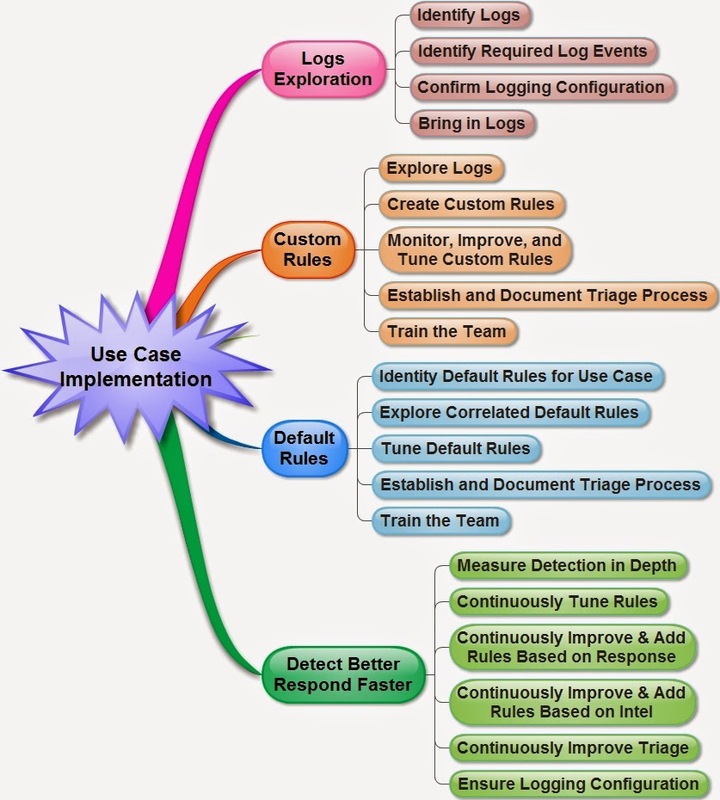 In past I had excellent results leveraging the Perl log2timeline and Regripper to create timelines. At this point the tools are not compatible. Plaso doesn't have a TLN parser (can't read RegRipper's TLN plug-ins) and RegRipper only outputs to TLN. Based on Harlan's upcoming presentation my statement may not be valid for long. In the end, leveraging categories in timeline analysis is very powerful. This train of thought is not unique to me. Others (who happen to be tool developers) are looking into this as well. Kristinn is as you can see in Plaso's support for tagging and Harlan wrote about this in his latest Windows forensic book. Side note: the purpose of this post was to highlight Plaso's tagging capability. However, for the best results the filtering capability should be used to reduce what items get parsed in the first place. The kitchen sink approach just takes way too long; why wait when you can analyze.